Scanning transmission X-ray microscope (STXM) principle is a simple one. A zone plate focuses X-ray beam into a small spot, a sample is scanned in the focal plane of the zone plate and the transmitted X-ray intensity is recorded as a function of the sample position. STXM name is usually used for microscopes working in soft X-rays range. 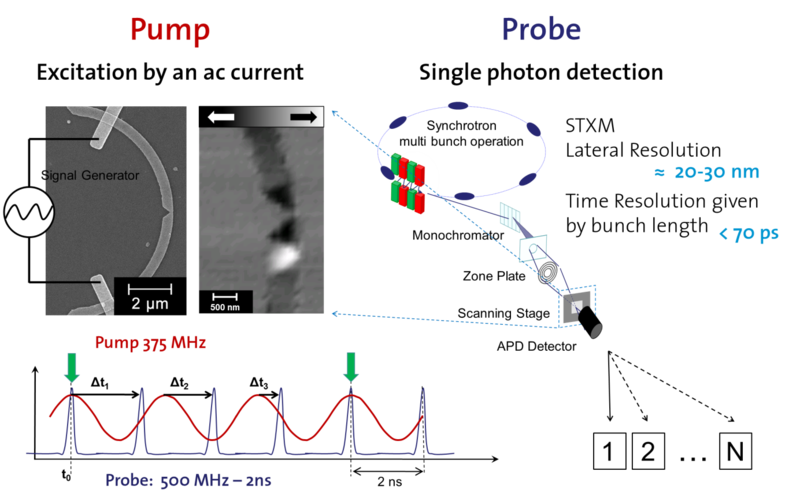 In order to achieve time-resolved imaging of the magnetisation dynamics of a certain magnetic configuration at a STXM, we employ a stroboscopic scheme where the excitation is the pump and the synchrotron x-ray flashes are the probe. Absorption of circular or elliptically polarized X-rays depends on interaction of this beam and magnetic moment of the absorbing atoms . The effect is called X-ray magnetic circular dichroism (XMCD). The sample can be tilted by 30° with respect to the X-ray beam, allowing for measuring the in-plane component of the magnetization. Figure 1: Illustration of time-resolved scanning transmission x-ray microscopy. The imaging is performed in a stroboscopic way by delaying the electronic excitation of a magnetic structure (pump) relative to the x-ray flashes (probe). Single Photon detection allows for multi-channel acquisition, which can be performed in standard multi-bunch operation mode of the synchrotron. Technical report "STXM in nanoscience", Tolek Tyliszczak and Kai Wei Chou. G. Schütz et al., Phys. Rev. Lett. 58, 737 (1987). A. L. D. Kilcoyne et al., J. Synchrotron Radiat. 10, 125 (2003).